You have this perfect idea of creating a blog that is going to be fed with eye-catching and breath-taking blog posts. You then decide to sign up on wordpress.com (or any other blogging platform of your choice) and start to upload your first posts. Only to find out that your content is not as spectacular as you thought it will be because nobody is actually reading your posts. So, after a few more trials, you see no progress and decide to abandon the whole blog. Why? Because you assume after a few trials that your posts are useless and boring for the audience? Slow down. Relax. The chances are, your blog posts have not even reached your targeted audience. In today’s fast-paced world, the internet enables you to connect with almost everyone around the globe. You must already know this when you first considered blogging. But what you might have forgotten is that the internet gives not only gives the reach but also a pool of tools to maximize that reach. One of those tools, given we narrow it to the blogging sphere, is Triberr – a blog post sharing platform that will give life to your blog (posts). Not by using fake humans that will artificially increase your readership figure but by connecting you with real humans who will help you grow your blog organically. We are not talking about social media bots, we are talking about a whole community of like-minded bloggers, who share each other’s contents and this way, support each other. Triberr calls this community a “Tribe”. So, how does this ‘Triberr’ platform, that I have (hopefully) hyped you on, work? Triberr is a platform that aims to connect like-minded bloggers to support each other. To understand how the platform works, let’s have a look at its core element: Tribes. Let’s say you are a fashion blogger looking for (more) readers to read your latest blog post that you put so much effort into creating. Triberr does exactly that. It helps you increase the readership rate of your blog posts by connecting you with another fashion blogger, let’s call this person Blogger A. Once you connect with Blogger A, after few procedures, you become a member of a tribe that Blogger A is currently enrolled in. That is, you are now surrounded by people who blog about fashion as you (aspire to) do. After you are officially in, you can start sharing your blog post in the community. What happens next is, once you share a blog post, your team members (called tribemates) will support your blog post by sharing your post on their social media – this way, your post reaches more people but also a more relevant audience. As said before, Triberr is a community of bloggers that support each other. As such, you should reciprocate the received favor you received by doing the same thing – you share your tribemates’ blog posts’ on your social media. Your tribe(s) hence becomes fuel for your blog’s organic growth. Triberr is a platform that aims to increase the same-sided network effect by engaging and connecting bloggers around the world. We can thus define Triberr’s business model as crowd-sourced based. In theory, it means that at Triberr, consumer co-production is high and a network is a unit of co-production (Tsekouras, 2019, p. 28). In lay terms, the previous sentence says that bloggers (i.e. consumers) are willing to actively participate in activities that will create value for Triberr which brings benefits to the platform but also to bloggers themselves. That is, Triberr grows as more bloggers are active on the platform but bloggers also benefit from a higher number of shares and thus, a higher readership of their blog posts. This mechanism thus satisfies the first efficiency criteria, which is [joint profitability] of partners involved (i.e. bloggers and Triberr) who work together to create greater value (Tsekouras, 2019, p. 35). Triberr works as a customer-driven value system and it works because both consumers (i.e., bloggers) and the platform both benefit from each other. To name a number of benefits for bloggers: an increased audience that is relevant, getting to know other like-minded (successful) bloggers from whom they can learn from, and satisfied social needs through the feeling of belonging into a community (aka tribe). To name a number of benefits for Triberr: lower marketing prices because of (electronic) word-of-mouth and increased platform value as the number of bloggers grow. In terms of effort and investment, both participating sides exert minimal efforts: bloggers produce contents they enjoy and outsource sharing efforts, Triberr leverages bloggers and outsources the growth of the platform to them altogether. In many cases, bloggers can abuse the platform by creating inappropriate tribes as well as tribes could be polluted with inappropriate bloggers. Triberr solves this issue by disabling aspiring members to join the tribe immediately. Aspiring members must first go through an “introduction period” in which they can follow their desired tribe and “join” the tribe as observers (Triberr, 2019). As observers, aspiring members’ posts are not (yet) visible to the members of the tribe. Nevertheless, they are allowed to interact with the members of the tribe and share their posts – this way aspiring members can “earn” the tribe’s trust and thus a place in the tribe. Only after observers become full members, their posts will become visible (and thus shareable) to all members of the tribe. Bloggers are responsible for their own content, which must be original. Contents that are perceived hateful or involving threat and harassment are taken care and act upon Triberr as well as US legal bodies. Moreover, a user’s identification is linked to the user’s social media profile to increase authenticity. In addition, a user’s privacy is protected by Triberr’s compliance with GDPR. As such, the Triberr’s feasibility of required reallocations, the second efficiency criterion, is considered met as (aspiring) members are carefully screened (by the community) and user’s trust is achieved with legal compliances. 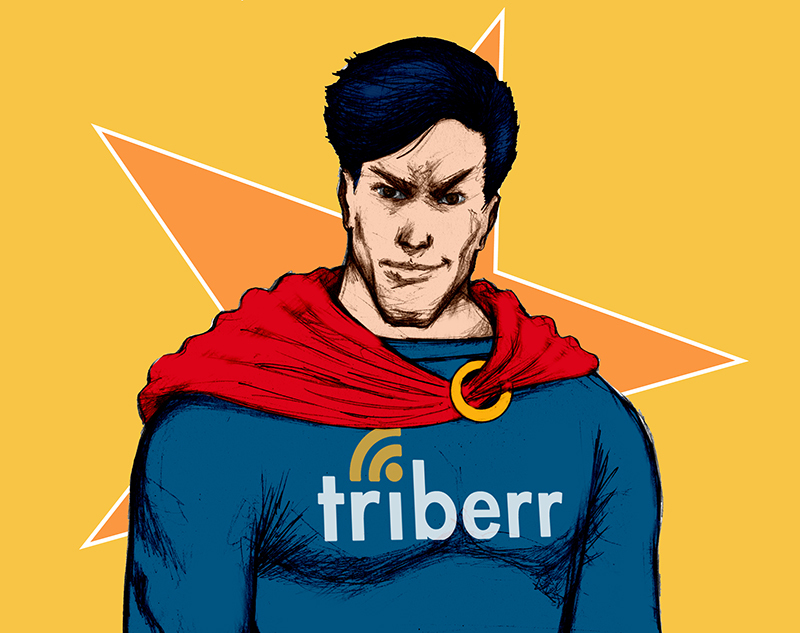 Triberr goes beyond tribe community and content sharing. In addition to the above-mentioned two services, the platform provides three premium services. Users can measure content performance with “triberrAnalytics” in the form of post analytics (e.g., number of clicks or content shares) and growth analytics (e.g., number of new and active members). With “triberrQueue”, users can optimize the posting time of their contents. Lastly, “triberrCurate” helps clients with discovering and choosing the relevant content for their targeted audience. Triberr man proof [Digital image]. Retrieved from https://help.triberr.com/wp-content/uploads/2015/12/triberr-man-proof-1.jpg.